The federal government wants more information on investors in Canada’s cannabis industry, hoping to prevent organized crime from infiltrating companies that produce legal marijuana. Health Canada announced on Monday that it plans to give itself new powers to obtain detailed and up-to-date financial information from companies with licences to produce and sell cannabis. The information would be required for new production licences, and be used to re-evaluate current ones. In cases where red flags are raised, the information would be used to suspend licences. The new disclosure rules are among proposed regulations Ottawa unveiled in a report on Monday that also include requirements for plain packaging and health warnings. The rules on financial information would apply to publicly traded and privately held companies, federal officials said. It remains unclear how Ottawa will track investors who participate in the cannabis industry through the stock market, where shares can be quickly bought and sold. Securities law allows investors to accumulate up to 9.9 per cent of the shares in a public Canadian company without disclosing their holdings. “We have heard from Canadians that protecting the integrity of the system is an absolute priority,” Health Minister Ginette Petitpas Taylor said. A senior federal official said at a news briefing that Ottawa wants a clearer indication of who has controlling interests in the companies and that this, plus the review system for awarding licences, will help the government determine whether organized crime is involved, the official said. No examples of criminal elements have been identified in Canada’s legal marijuana market. However, the government has been criticized because dozens of companies established in tax havens have invested in businesses that have production licences, raising questions about the identity of the ultimate owners or beneficiaries. Hedge funds were key investors in the early days of Canada’s marijuana sector, and helped several companies get off the ground. While many have offices in Canada, they are often registered in tax-friendly jurisdictions. A lawyer who specializes in the cannabis industry said the new rules on financial disclosure will fill a gap in the system of security clearances, and that more information is still needed. The NDP said it is about time Ottawa started taking action on this front, while the Conservatives worried that criminals will still be able to use tax havens to invest in Canadian producers. The final rules will be released after Parliament adopts the bill to legalize cannabis, which is expected in June. Legal marijuana would be on sale two or three months later, at a date decided by the federal cabinet. The government made it clear that it will adopt strict rules for packaging and marketing of legal cannabis products to protect young Canadians. Health Canada wants packaging that is child-resistant, opaque, without graphics or images, and in one uniform colour. Embossing or shiny lettering will be prohibited, while branding and logos will be restricted. All products will also need health warnings that say marijuana can be addictive, harmful to a fetus or nursing infant, and should not be used before operating machinery. 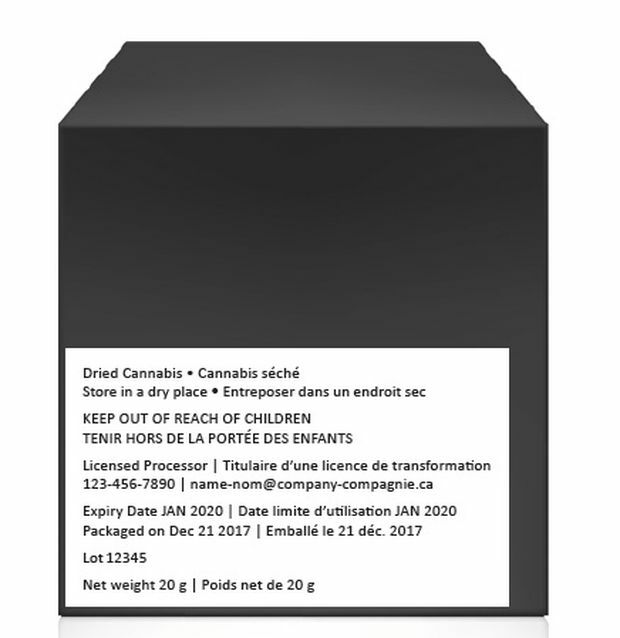 A logo in the shape of a red stop sign with a cannabis leaf and the letters THC will be required, and information on levels of active ingredients. Cam Battley, chief corporate officer at Aurora Cannabis Inc., said he would have preferred recreational cannabis packaged in a similar fashion to alcohol products rather than like the regime for tobacco. He said Ottawa’s plan will threaten the success of legal sales. “I think the federal government will have to evolve those regulations – and probably quite early. Because if we do not see a rapid shift from the black market to the legal, regulated market, that suggests the risk of a policy fail. And the federal government doesn’t want to be facing that,” he said. As part of its plan, Ottawa would start granting a new category of licences that cover microcultivation and microprocessing. The small-scale producers could grow cannabis in production facilities of less than 200 square metres, or process less than 600 kilograms of dried cannabis a year. Example of back of proposed packaging.